John Boorman is the director behind Point Blank, Deliverance, Zardoz, and Excalibur, but his CV nearly included a Lord of the Rings movie. It would have been a pretty bonkers interpretation, with Aragorn wielding double blades and Frodo and Galadriel getting it on. 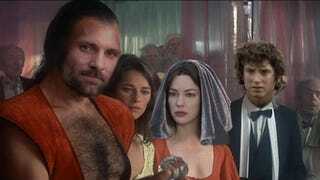 Boorman has said in his autobiography Money Into Light, and more recently in an interview with Indiewire, that in 1969 he had actually hoped to make an Arthurian legend movie. When he brought his proposal to United Artists, however, it was suggested that he do a Lord of the Rings movie instead. So Boorman and aspiring screenwriter Rospo Pallenberg set to work creating their own version of J.R.R. Tolkien's works. The pair are not what you would call faithful to the text. Cinetropolis lays out the story of Boorman's never-made Lord of the Rings, quoting liberally from Boorman's autobiography and an interview with Pallenberg in Outre magazine. Boorman was charged with condensing the trilogy into a single film, and he and Pallenberg churned out a 176-page script with a built-in intermission. Frodo becoming intimate with Galadriel before gazing into her mirror. A kabuki-style play to explain the history of Middle Earth, notably Sauron's creation of the rings. An expansion of Gimli's character. Gimli is beaten "to utter exhaustion to retrieve his unconscious ancestral memory," giving him special insights into the ancient dwarven kingdom. GANDALF: I am the well that traps the waters! Because of budgetary concerns, flying creatures were eliminated. Instead of riding a Fellbeast at Minas Tirith, the Witch King would have ridden "a horse that ‘seems to have no skin. Its live, raw, bleeding flesh is exposed.'" Eventually, UA tapped Ralph Bakshi to make his animated Lord of the Rings after buying Boorman's script. Boorman and Pallenberg used their experience with Lord of the Rings to film the Arthurian movie Boorman wanted to make in the first place, Excalibur. (But not before Boorman made the wonderfully weird Zardoz.) Their script for The Lord of the Rings is currently housed at Marquette University, as part of the school's Tolkien collection.